Vancouver's Swollen Members have enjoyed a lot of success as mainstays of the Canadian hip hop scene. They've sold a nice number of records and won Juno Awards. Now they are back with a new concept album Beautiful Death Machine (a title which is not at all like Pretty Hate Machine). It probably won't surprise you at all that the concept for the record is, well, death (complete with cover art that looks as though it should contain an '80s metal LP). The tone for the album is set by "Inception- Darker Side Interlude", which has a heavy Twilight Zone atmosphere. It's science fiction version of death and destruction that are behind "Juggernaut". The most hard-hitting cut comes in the form of the guest-heavy "Colossal Beasts". A slither snake-charmer vibe is created on the standout "River Monster- Underground Interlude". Strangely, "Death To You" has a lighter, almost whimsical air. "Difference- Watts60 Interlude" is brighter, with a peppy piano loop. Rapid-fire delivery punctuates the bottom-end ebb and flow of "Bax War". Some of the lyrics come perilously close to crossing the good taste line. 'I kill kids like an abortionist' may not be the most well-conceived rhyme in the history of music. 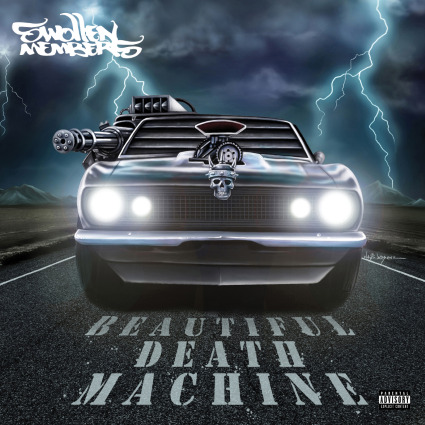 As far as concepts are concerned, Beautiful Death Machine is a promising one. The songs are little bit too impenetrable to wholeheartedly embrace, which makes it more difficult to enjoy the record than it really should be. Swollen Members play The Rockpile in Etobicoke on April 12th. Best tracks: "Bax War", "Colossal Beasts"